Universal Waste Systems of New Mexico proudly provides residential waste collection services in the unincorporated areas of Sandoval and Valencia counties, as well as in Village of Rio Communities, NM and the Village of Cuba, NM. To avoid damage to roads or vehicles during inclement weather events, service may be delayed until road conditions improve. HOLIDAY SCHEDULE: UWS observes the following holidays: New Year’s Day, Memorial Day, Independence Day, Labor Day, Thanksgiving, and Christmas. Your service will be delayed one day after the holiday through the end of the service week. PLEASE BAG AND TIE ALL TRASH TO PREVENT BLOWING WASTE! 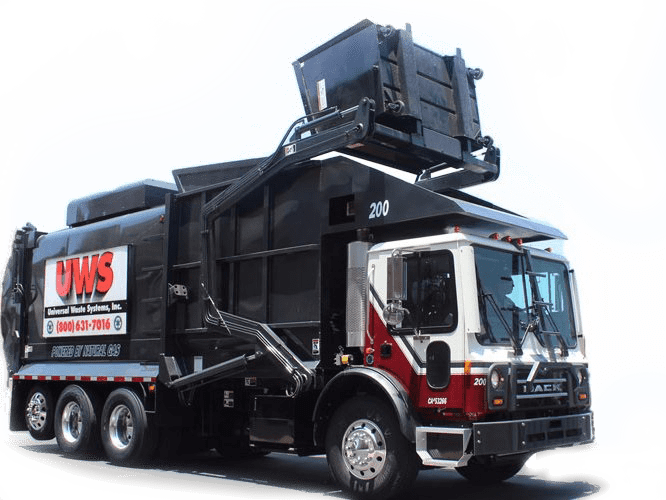 Universal Waste Systems of New Mexico is a full service trash company providing waste collection solutions to our customers in Valencia, Sandoval, Bernalillo, and Rio Arriba counties and surrounding areas. We provide a comprehensive menu of waste collection solutions, including residential collection, roll off containers, commercial dumpsters, compactors, cardboard balers, solid waste collection facility operation and management, and design/build facility projects. Universal Waste Systems, Inc. is your one-stop waste collection service that has been successfully doing business since 1971 throughout the southwest. Currently, we operate 9 locations throughout New Mexico and southern California, providing services to over 200,000 residential, commercial, industrial, construction, and multi-family units. UWS collects, processes, and transfers over 250,000 tons of solid waste, recycling, and green waste per year. We provide affordable weekly residential waste collection services through our community-centric service contracts. Let us make your job easier! We will help you find and rent the perfect container for your needs. Select from our high-quality recycling services that will give you the confidence that your paper, plastic and metals are being recycled. UWS encourages all residents to take responsibility for their environment and to work together to improve the community in which they live, work, and play. Universal Waste Systems of New Mexico commits to the highest standard of customer service as our first priority. Let us help you determine solutions that best address your solid waste needs. A simpler process to waste collection. Call us today to schedule a free, on site waste analysis; our team of professionals is standing by to serve you. You will speak with a live customer service representative that is equipped to assist you 5 days a week.